The pots and pans are a reference to Montreal's <a href="http://montreal.ctvnews.ca/casserole-protests-ring-out-across-quebec-1.831119">"casserole" protests</a>. Rob Ford may live to regret <a href="http://torontoist.com/2013/11/mayor-rob-ford-i-have-nothing-left-to-hide/">those words</a>. The kids have to learn about crack <em>sometime</em>, right? Sign of the day, right here. The turnout was between 150 and 300. "Drunken stupor" is a phrase that will haunt Rob Ford for the rest of his life. Good pun, but the marker work could use improvement. WHEN: Wednesday, November 6, 12 p.m.
WHAT: The mayor apologized on Tuesday for smoking crack and drinking to excess while in office, but it seems as though his speech didn’t leave everyone satisfied (it certainly didn’t satisfy us). 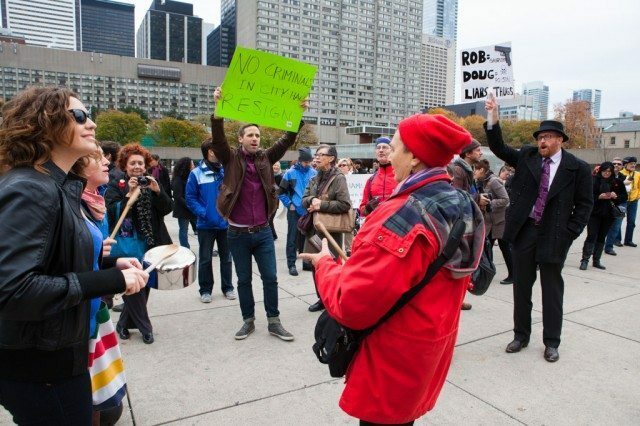 For the second day in a row, protesters took to Nathan Phillips Square to demand Mayor Rob Ford’s resignation. Click through an image gallery for a look at their signs.